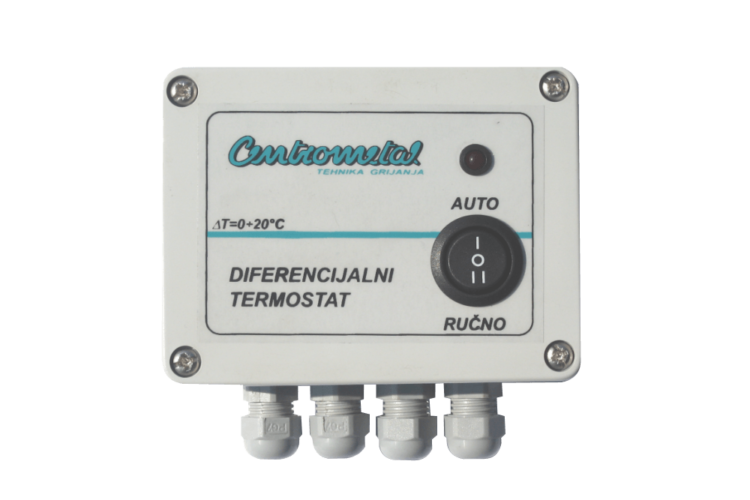 The differential thermostat manufactured by company Centrometal d.o.o. is intended for installation in solar systems or central heating systems where it is needed to switch on (switch off) the pump according the set (adjusted) temperature difference. The differential thermostat has compact dimensions, it is placed in the plastic housing, wall hanged. It is mounted on the wall with 4 screws which is not delivered together with the differential thermostat. Together with the differential thermostat 2 sensors type KTY are delivered which are very easy to connect with the differential thermostat.The sensors are fastened on the tube by the help of a plastic cover and bindings. The setting of the difference switch on/off the circulation pump is done by help of a trimmer which is placed in the thermostat housing and is set in the factory on the difference of 10°C. Compact housing for wall hanging. Functioning mode choice: automatic or manual. Functioning mode of the thermostat displayed through a signal light. Functioning range setup: on/off switching within 0-20°C. Delivered with all necessary sensors.